Available in over 10 sizes to meet varied requirements. When it comes to couriers, no one does a better job than DTDC. They have pioneered in the business of delivering packages to customers within target time anywhere in India. Years of experience develops brand value which is untarnished. You can benefit from the same goodwill with their branded packaging. We offer white boxes which are branded with DTDC logos and colours. You get the assurance of durability of the boxes from DCGPAC and the brand name and goodwill from DTDC. 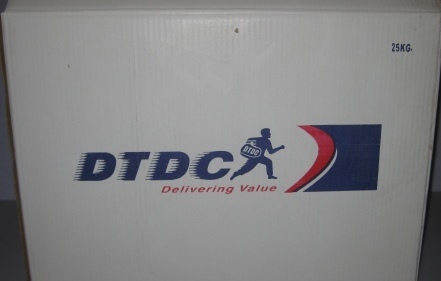 If you are looking for good quality boxes for sending goods through courier, nothing comes close to these DTDC branded boxes in white colour. Apart from being sturdy and robust, these boxes are visually appealing as well. They are the best bet when you need to transfer goods from one place to another. All these boxes are available in 10 different sizes so that it suits your needs no matter how big or small the goods are. Even if the sizes aren't fit for the goods you want to deliver, just leave an enquiry of your requirements and we'll do our best to serve your needs. 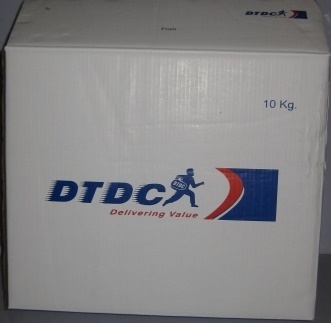 The DTDC branded boxes are the perfect fit for sending shipments through courier or other surface transports. All the boxes look elegant in design with DTDC logos and follow the brand guidelines in every box. Even E-Commerce shipments can be repacked in these boxes and then sent for a professional looking delivery. These boxes come in 3 ply and 5 ply depending on the size you choose. Quality wise these are very strong boxes and can handle a good compression rate. They keep the goods inside them safe. The quality of DCGPAC and the branding of DTDC are unmatched when it comes to boxes. You can buy DTDC branded boxes in white online from DCGPAC at really low prices and are of great quality. Avail these boxes conveniently by ordering them online and getting them delivered to your doorsteps within no time.